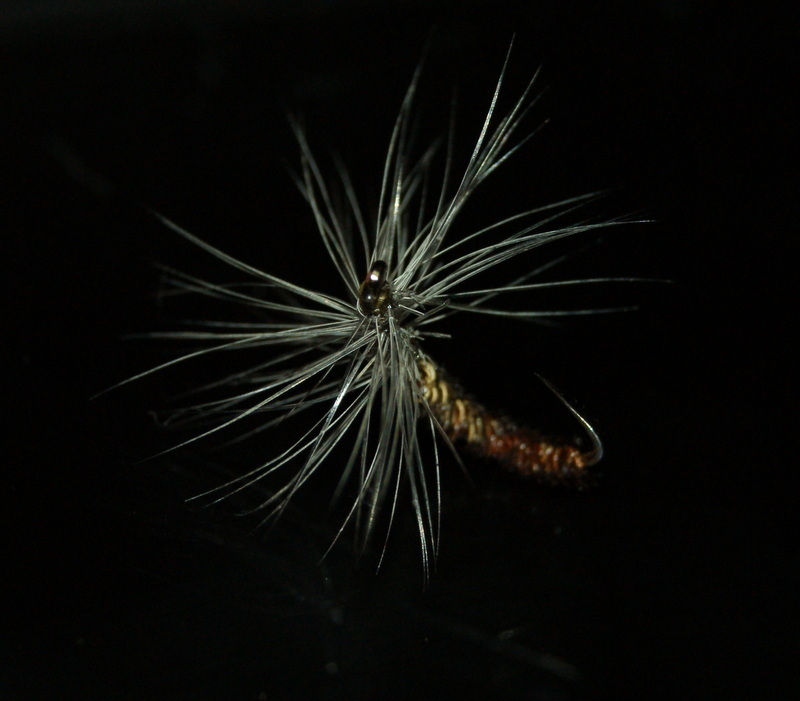 It’s great to have the dry-fly setup once again and my go to pattern early season is the pheasant tail emerger. Fishing is still slow but I enjoy just creeping around the river when the hatches start. At the moment the large dark olives are coming on around 11am to about 2pm and then they tend to peter off, but in this time you can have a little fun, they don’t turn their noses up to this pattern and It have accounted for many of my big fish that I’ve managed to catch over the years on my local waters! This entry was posted in Fly Tying, Harvey Angling, River Clydach, River Ebbw, River Rhondda, River Rhymney, River Taff, The river Wye and tagged dries, Dry fly patterns, fly tying, flyfishing, Harvey angling, Kamasan hooks, klink and dink, large dark olives, rising trout, river taff, south wales, Terry Bromwell, trout on March 15, 2015 by fishstalker666. After speaking to Kieron Jenkins in the week at Gareth Haveys fishing shop where Gareth was holding a ospreys night with a 10% off everything, we decided to go give somewhere a look on the weekend to see if we could nail a few grayling. That was if the rivers dropped off after the crazy weather we had on thursday and friday. Kieron picked me up at 8am and then we went and picked up Sam Richards, a young youth angler. The taff was still pushing so we decided to go over and give the Rhymney a look. It’s great to have so many great rivers just a stone throw away from the house that hold grayling for the winter fishing. It was a quick stop to purchase our day tickets and off we set eagar to find a few graylng. After a short drive we got to where we wanted and before we knew it we were on the bank ready to step in. The river was running with a few inches over normal and a slight colour to it but was looking good. The method of the day was heavy nymphing keeping a short line and using heavy bugs to get them down hard on the deck. Sam was the first to enter the river and was the first to hook into a grayling and shortly after a second came to the net, Sam had it spot on. Kieron moved on down river picking his way through the water not leaving anything unfished, so I moved on up river out the way and after a bit I manged a trout but nothing after that for some time. I moved on back down to find kie and sam, after a short walk I caught up with them and after that we all stuck together just working the likely looking spots for the grayling, Sam stepped in below us in a little deeper water and shortly after sam was into a fine grayling on the dropper fly. Sam stayed in this pool for some time then hitting into something totally different, me and kie could see this was a decent fish. Kie stepped in to give him a few pointers and to ready the net but it was a long way from being netted, the fish held deep and just made his way up river and then back down, then it showed itself in a blast of energy by jumping clear of the water around 3ft. It was a salmon estimated around 8/10lb easy. Sam done his best but it wasn’t to be, the fish took him down river and pulled the hook after around 5 minutes. Unlucky sam but what fun fair play. After that little fun we moved on and kie just done what he does best and started to pick off grayling in the good numbers and me,well i was a little slow this day and just couldnt conect with many fish. Its good to have a few bad days because it makes you more egar to get out and get it right! 🙂 It wasnt long after and the tempture started to drop and the light was faiding so that was a q to make a move.. Not a bad days fishing and far from easy but we all fooled a few so happy days. This entry was posted in Harvey Angling, River Rhymney and tagged fly fishing, grayling, Heavy bugging, Jig hooks, Kieron jenkins, Nymphing, nymphs, River Rhymney, river Taff in flood, short nymphing, Terry Bromwell on December 8, 2012 by fishstalker666.